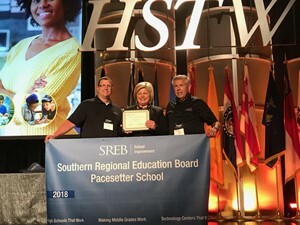 Penta Career Center is proud to announce that it is the recipient of a Pacesetter School Award from the Southern Regional Education Board (SREB). Teachers and administrators were on hand in July to accept the award during SREB’s Annual High Schools That Work (HSTW) Staff Development Conference in Orlando, Florida. Penta was recognized for using key practices to transform teaching and learning and motivate students to succeed in college, careers and life. The school adopted an individualized, teacher-led approach to professional development. Penta was only one of seven school districts across the United States and the only school in Ohio to earn this award. Penta has been using the HSTW school improvement model through SREB since 2003. HSTW is nationally recognized for its effectiveness and is the nation’s largest school improvement initiative.